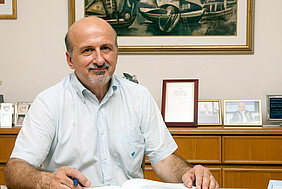 Constantin Zopounidis, Professor at the School of Production Engineering & Management of TUC, has been recogized as one of the most productive and influential authors in the European Journal of Operational Research (EJOR). According to a 40th Anniversary Paper entitled "Forty years of the European Journal of Operational Research: A bibliometric overview" (Volume 262, Issue 3, 1 November 2017, Pages 803-816), Prof. Zopounidis is placed 28th out of 50 OR & MS scientists who have published in EJOR and are considered to be the most productive and influential authors in those areas. The paper presents a general overview of the journal over its lifetime by using bibliometric indicators. The results indicate that EJOR is one of the leading journals in the area of operational research (OR) and management science (MS), with a wide range of authors from institutions and countries from all over the world publishing in it.